There's so much to see and do with more than 30 exhilarating rides and amazing experiences to discover. Oakwood's unique combination of attractions includes world-class roller, tower and sky coasters, spectacular family rides, children's themed play areas and so much more. 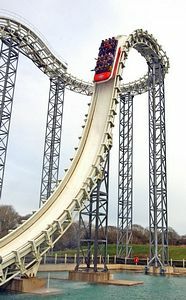 From the fast and furious world of the Extreme white knuckle experiences and the Family rides to the more gentle fun of Playtown and the extensive grassed and wooded areas, the park provides unforgettable experiences for everyone to enjoy. Thrill seekers can brave Speed, our newest white knuckle ride and the UK's first rollercoaster with a beyond vertical drop. Or why not try Megafobia, the award-winning wooden coaster with character! Not afraid of heights? Well, what about The Bounce, a 160ft Shot 'n Drop Tower coaster which shoots riders into the air at speeds of 70 kph in under two seconds. Or maybe you fancy cooling off on Drenched, the steepest and wettest ride in Europe! For those who prefer a slightly slower pace we have fantastic family rides for everyone to enjoy. You can whiz around the slides of Snake River Falls, pilot a plane on Plane Crazy or take a relaxing paddle on the Boating Lake. Joining these great rides are The Waterfall, Bobsleigh, Spooky 3D, the Pirate Ship and many, many more the only problem is making sure you have time to squeeze them all in! For smaller kids there's plenty of fun to be had in KidzWorld. There's the undercover adventure playworld The Lost Kingdom and the indoor discovery world Techniquest where youngsters can experiment with more than 30 hands-on science exhibits. In The Wacky Factory, they'll have a ball! Equipped with thousands of soft balls, banana blasters, air fountains and levitation tables, this is an amazing interactive play zone where kids can go wild! For the little ones there's also Playtown, where they can ride the Clown Coaster, pilot a jet plane or cause chaos on the roads in their own trucks.